2500 cranes in one place! Superb photos of them and the other birds also. We don’t see Sandhill Cranes in our area, so this is a real treat for me. Thank you Jet and Athena. Yes, I’d never seen so many cranes in the Delta before, it was astounding. We had so much rain, that’s one of the big factors. During drought years we don’t have those numbers. You would like it here, Hien; though your birds on the Atlantic Flyway are also awesome. We have more cranes, but you have more warblers. Smiles to you, Hien. What an incredible day and the patience of you and Athena brought us all a beautiful documentary. Thank you Jet. I love to see large birds in flight. I like to see large birds in flight, too, Sharon. The cranes tend to fly a little lower than geese, and seeing their wingtips with spread “fingers” is really a treat. My warm thanks for your visit today. As always my pleasure Jet. They’re loud too. Sometimes you can hear them miles away, providing you’re not flooded with city noise. They are loud, you’re right, Craig. It’s a distinctive sound, easily recognizable once you’ve learned it. I have had so many dusk experiences on rainy days when they were coming into the field to roost, you could hear them so easily, but could not see them. Then they would descend through the cloud cover and land. Beautiful. Thanks for your contribution. They blended into the field so magically, if we hadn’t been scanning with high-powered binoculars we never would have seen them. Many thanks for your visit, John, always a joy to “see” you. Yes, it’s a whole globe full of friends, so fortunate. I’ve met four blogging friends, and if you’re ever in the Bay Area, I hope you email me ahead, John, to meet up if possible. I can’t imagine seeing so many cranes in one spot. Beautiful photos! I love the Black Phoebe. I have a soft spot for those little nuggets. Thanks for sharing! Glad you enjoyed the cranes and the phoebe, Jill. I love phoebes too. 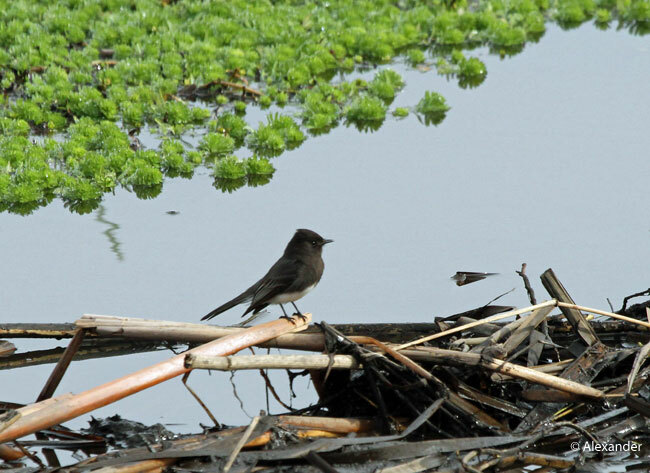 The black phoebes tend to be around water, and they have a piercing chirp that makes them easy to spot. I see black phoebes in fields, backyards, gardens, cities, towns, suburbs, and one who likes to perch outside my office window in the summer. Uses the deck railing as a perching spot. I hope you have a great weekend, and thank you. 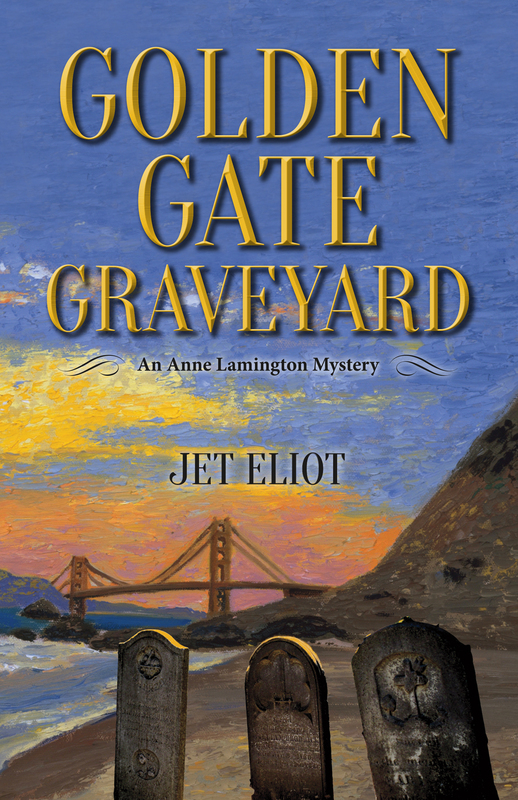 Thanks, Jet – I really enjoyed this lovely post about the cavorting cranes. What a sight! Splendid photographs from Athena once again, and the stilts shot had me smiling. Happy to read your patience was rewarded with a huge camouflaged flock to observe. Such a joy to share the cranes with you, pc. It doesn’t feel like being patient because we’re surrounded by so many birds with so much to do–spotting, identifying, photographing, counting, taking notes. And of course, smiling. But it was indeed a great reward when we came upon that huge flock. I have no doubt you and Mrs. PC and Scout will be outdoors cavorting yourselves this weekend — have fun! Fantastic, what a privilege to see so many cranes! 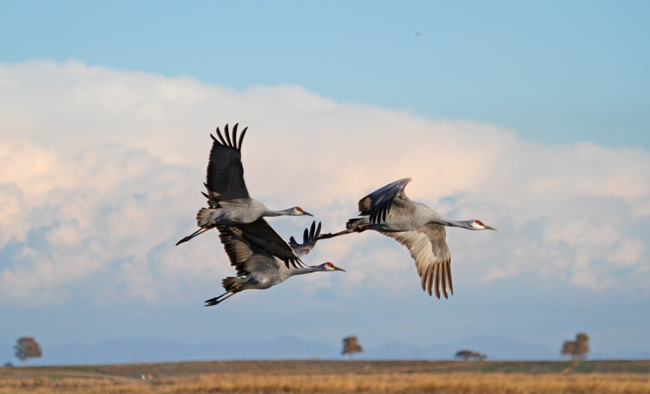 The Blue Crane is South-Africa’s national bird and is sadly threatened, but a lot is being done to save the species. Beautiful photo’s, Jet. Yes, it is a sad fact that many of the world’s cranes are threatened, due to loss of habitat and hunting. I’ve seen the blue crane, but only in captivity, it’s a beauty. I’m really grateful to conservation efforts that stem back decades in saving the sandhill crane from near extinction, and happy I could share them with you, Dina. Thanks for stopping by. I’ve seen them dancing in the Queen Charlotte Islands and migrating over Montana. They are one of my most beloved birds. Wonderful post, Jet. What a lovely first sentence you gave us, Anneli…”dancing in the Queen Charlotte Islands and migrating over Montana.” They are also one of my most beloved birds– great fun to share this mutual enjoyment with you, thank you. you so eloquently summed up these birds, Jet – elegant and stately! i agree that you are so blessed to savor nature’s many wonders. thank you so much for sharing. as always, great photography! A true pleasure to share the sandhill cranes with you, Lola. Thanks so much for your kind words. You have to love sandhill cranes! They are so beautiful ! ! I sure do love sandhill cranes…I’m glad you do too, Bill. Always great that you stop by, Bill, thank you. 2,500 cranes, Wow!! I haven’t seen Sandhill Cranes here in Texas. They are beautiful. The last shot of in flight is magnificent. You are lucky in TX to have the sandhill and the whooping cranes, Amy, maybe you will see them someday. I’m glad you liked that last shot of them in flight, I really like that photo a lot, too. Always wonderful to have you visit, thank you. Thank you for the information, Jet. We have seen the whooping cranes at the Aransas, Gulf Coast. Awesome. I want to go up and see the swans. I saw hundreds of them but had no time to stop. 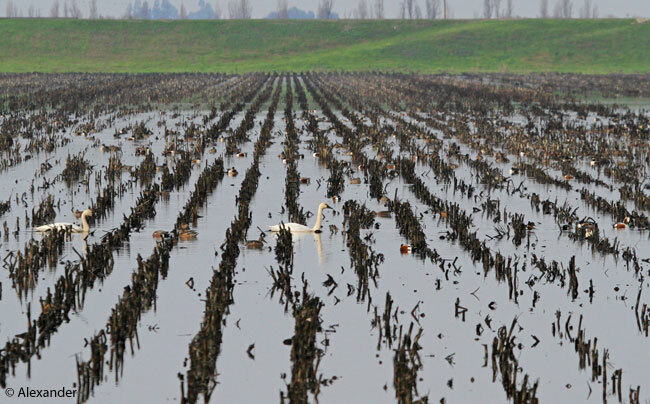 We found several hundred tundra swans in the Delta too. And knowing how intrepid you are with photographing beautiful birds, Cindy, I have no doubt you will stop and see them soon. Cheers, my friend, and many thanks. Thank you very much, Vera, I am happy you enjoyed the cranes today. Thanks very much, Christian, I’m glad you enjoyed the sandhill cranes today. They are an interesting-looking bird, I especially find the bustle unique. Thanks for dropping by. I like thinking about the cranes’ patterns, thanks for that, Alastair. It’s always a treat to hear from you, thanks so much for making my day. Always makes me happy to know I inspired someone, thanks so much, David. You give me a smile, thank you. And have fun out there with your camera! “…so lovely just to be there.” Your words capture the delight so well, Jo. And how incredible to find flamingos. I love watching flamingos in the wild. Many thanks for all the joy here, my friend. A wonderful presentation that put me in a meditative mood, relaxed with the knowledge that the rainy season in CA affords a home for creatures such as black phoebe, black-necked stilts and so much more, not to point out too directly the thousands of elegant sandhills, the thought of which excites the possibility of seeing these birds again, and to hear their trumpeting while observing their magnificent dance. Thanks Jet! I loved your comment, Walt, thanks so much. My original draft had more facts and links and I just deleted it all. Decided to focus primarily on that one magical hour. I appreciate you noticing this emphasis, and am glad the words had the desired effect. Truly a treat, thank you. We have to go up to Reno often to see family and we generally take the Zephyr (Amtrak) – one of my favorite stretches is across the swamps. We always see tons of birds – it’s just lovely. I have enjoyed your Reno railway trip posts, Jan, and now I really like knowing that you see lots of birds in the swamps. Swamps are often birdy, but can be uncomfortable birding, so the Zephyr sounds like the perfect solution. My warmest thanks. Wow, that must have been a sight (and sound) to see. I’ve only seen a few in FL, I can’t imagine seeing thousands! 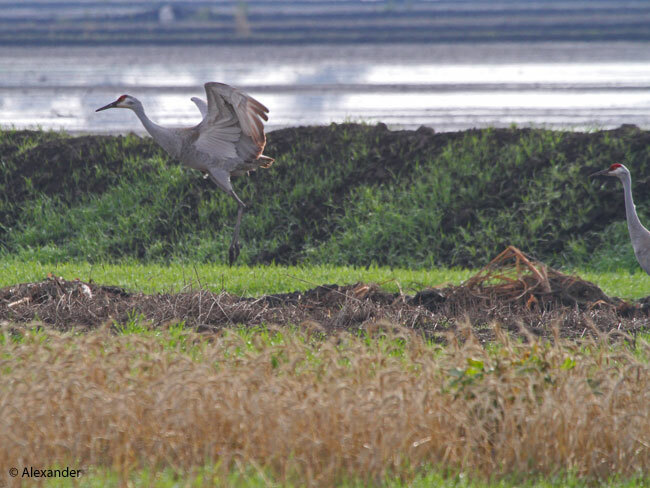 It really was a spectacle, Eliza, and for as many times as I have ventured up there to the Delta, this one had by far the most abundant cranes. Thanks for coming along with us. WOW. It sounds as if you really hit the jackpot there this year! But then you and Athena see so much more than most of us – wherever you are! Thanks for sharing! Yes, we really did hit the jackpot this year. Lots of rain and we happened to be there on a day when it wasn’t raining, which just added to the ante. I know you’ve been hearing me go on for decades about our winter trips to the Delta every year, it’s so kind of you to still take an interest. My warmest thanks. Don’t you just love seeing things no one else sees? What prodigious travelers the cranes are and I also enjoyed the glimpses of some of the other birds. Have a wonderful weekend! If folks are out walking around I usually point out the spectacle, if I think they’ll be interested. But in this case, they were all inside their cars. I’m really glad you enjoyed the crane and bird photos here today, Janet, thanks so much. I hope you, too, have a wonderful weekend. Beautiful, majestic birds! What an amazing sight to see a flock thousands, Jet! I’m glad I could share this wonder with you, Donna. Thanks so much. Loved your words here today, Val. Cranes have a way of sharing their messages, and I thank you for sharing yours. Yes, the sandhill cranes do have graceful mannerisms, the way they dip their head, walk with purpose, dance with joy, and fly with grace, all the time displaying their elegant bustle of fine feathers. I’m glad you’ve seen this crane in Florida, HJ. There are two subspecies in Florida, one that is non-migratory, and one that is migratory spending the winter there from the Great Lakes. I read that they’re most abundant in the Kissimmee and Desoto prairie regions, according to the Florida Fish and Wildlife website. Always a joy to share bird info with you, my friend, thank you, as always, for your contribution. Terrific photos! We get to see them only once in awhile here, and then just a few. Thanks so much for stopping by, montucky, and how wonderful that you’ve seen this lovely bird. 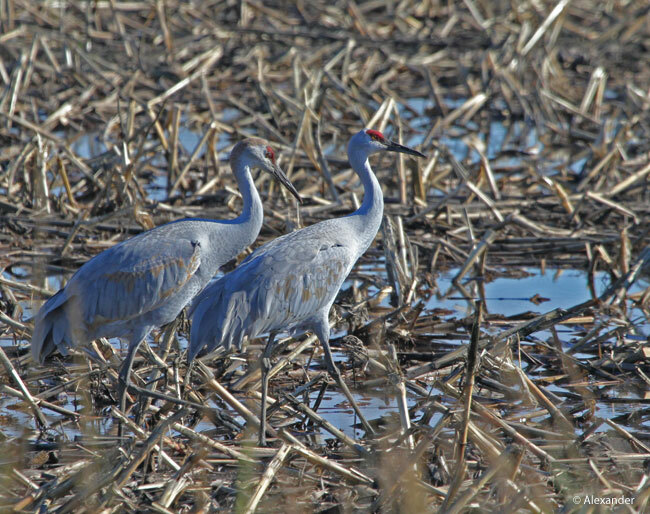 Regardless of the numbers, we don’t forget our moments of observing the sandhill crane. I understand, nighttime during the migrations, the flocks of cranes can be heard far overhead. Thanks for this vision. Oh how glorious it must be, Michael Stephen, to hear the migrating flocks at night. I’m glad I could provide the vision, and I thank you appreciatively for the nighttime version. How wonderful too see such a crane full scene. I am delighted to have brought the cranes to you, Sherry. Thanks for stopping by. I’ve been searching for them here, but we have so much water in the fields this year they’re scattered, and I hear them far more often than I see them. 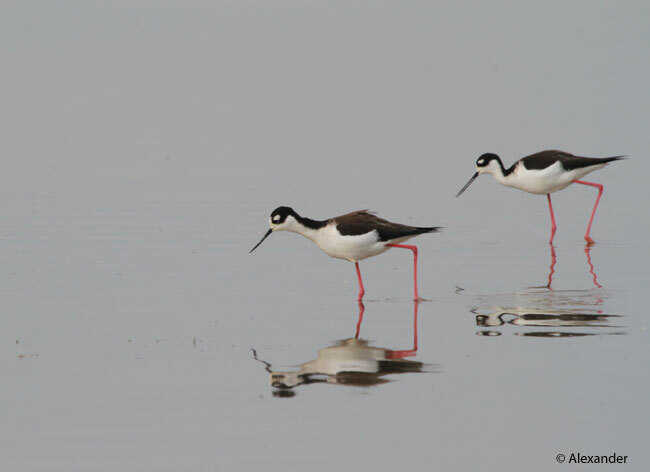 I found one small group at the edge of a refuge recently — in an old rice field, of course — and I came across a pair on Galveston Island. Some people see many more, but it’s partly luck and partly having the time to just drive the back roads. I’m so glad you were able to experience such a large group. 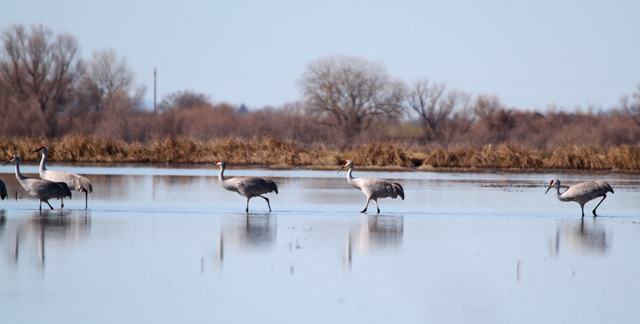 I’ve toyed with the thought of heading to Bosque del Apache National Wildlife Refuge to see the thousands of cranes there next winter. Maybe I will, or not. But it would be wonderful. I smiled when you mentioned the Delta. The great irony is that I spent a year traveling to Rio Vista every weekend, and at the time I didn’t care one bit about birds or flowers or the natural world. I liked them well enough, of course, but I never would have made a stop simply to watch the birds. Silly me! How funny that you went to Rio Vista so many times, but not into birds and nature then. Life is funny, right Linda? Great that you hear them often and know their sound. Always a joy to have you stop by, thank you so much. A pity the light wasn’t cooperating, but just hearing them is such a huge pleasure. Athena did manage to catch some lovely images of the more solitary cranes. Hope that was good enough… though I do know the disappointment when the lighting is awful. Great shot of the stilts though! and the group in flight is awesome. Yes, the hazy lighting was unfortunate. The cranes were very spread out, too, only an aerial could’ve captured them all. Athena was happy about that stilts shot, glad you enjoyed it too, Gunta. We also had the most wonderful experience with a river otter, I’ll post photos of that separately. You how nature is, Gunta, there aren’t really too many disappointments in the big picture, because there’s always something interesting to watch, even if it’s not photographable. Always great to have you stop by, thank you. What a beautiful scene you painted with your words and the wonderful selection of photos (especially the shots of them flying)! It must have been an amazing sight to watch a flock of 2,500 cranes and I’m looking forward to when they return to our area. that sounded magical Jet! Finding that number of Cranes must of felt like winning the lottery! The collective nouns for a group of Cranes is a HERD, SEIGE or SEDGE. Your choice. When I’m in the same situation and do not want anyone else stopping or possibly spooking the animal I’m watching/photographing. I turn and looking in the other direction.People will be looking trying to find out whats so interesting but unaware of whats in the other direction! Loved hearing your secret to keeping the masses from stopping and disturbing the animals, Wayne, it is one we, too, use often. Something like the fake-out in football. Really enjoyed hearing your version of it. And yes, it really did feel like winning the lottery, with all those cranes. When one is scanning with the high-powered binoculars, you can see so much farther than the naked eye, and what a bonanza to find this herd, siege or sedge of cranes. Always a joy, my friend, thanks so very much. I figured you’d already be doing that Jet. I use a small attachment for my binoculars.It screws into the front and can be attached to a tripod.It makes viewing much better with being so steady and also stops the blood from draining from my arms! A few years ago I saw a solitary sandhill crane at Okefenokee National Wildlife Refuge in Georgia. 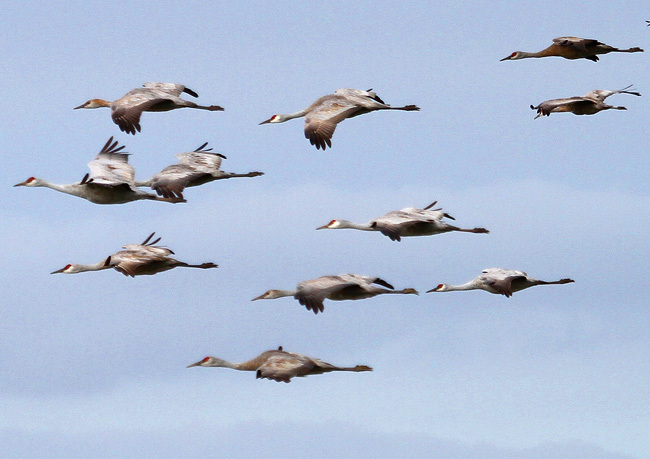 How thrilling it must of been to see 2,500 sandhill cranes in a huge flock! Love the pizzazz of the male’s dance steps. And that one crane you saw, Barbara, in the Okefenokee Refuge, you never forgot. Cranes have a way of staying with us, don’t they. Loved hearing your story, thank you. What a wonderful experience that must have been! We don’t see these birds here, so I particularly enjoyed seeing Athena’s beautiful photos. A joy to bring the sandhill cranes to you, Belinda, thanks for stopping by. I’d’ve thought February too soon for the sandhill cranes to head for northern North America and northeastern Siberia, unless the birds move slowly and arrive much later than when they depart. I know it’s too soon for me that they leave…I always wish I could get one or two more visits in before they depart. Thanks for stopping by Steve. Well, the flock has to start somewhere, lucky you had that brave solo visitor, RH. Thanks so very much, my friend. Jet this sounds like a magnificent bird outing! 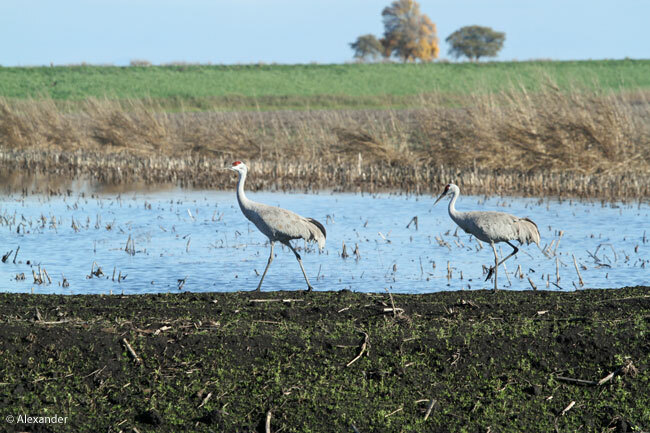 We’ve been coming to the Delta every winter for three decades, John, watching the cranes. And I’m sure you know what I’m saying when I say, it never repeats itself, and it never gets old. Cheers, my friend, and many thanks. Wow, thousands of Sandhill Cranes! I have seen only a few, and even in 10+ years of regular trips to Florida and visits to other Sandhill Crane habitat in other parts of the country, I never saw any until a few weeks ago. They are incredible birds! They certainly are incredible birds, Marsi. I am glad you’ve had the opportunity to see sandhill cranes. We both share a love for this bird. Thanks for your visit.